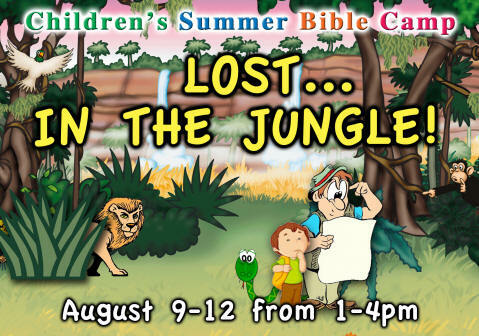 To book your children 5-12 years for another great Summer Bible Camp focused on THE JUNGLE OF LIFE! This Children's Camp will be 4 days of Fantastic games, sports and activities, exciting Bible learning times, snacks and refreshments, awards, and much, much more! The races, memory-work and competitions will be an opportunity for team-building, and personal encouragement! The children will learn to explore, and discover life, and to beware of the many dangers that hide just outside of view. Everything is FREE, but every child must have their parent's permission by filling out the following information, and bringing it with them to register. If you would like your children to attend, please fill in the Booking Information as listed below, and present it at the Bible Camp registration.